A daily newspaper established more than 160 years ago has closed down after the company that produces it entered administration. 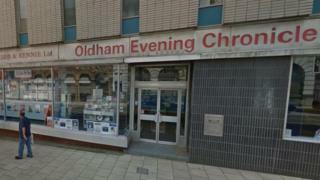 The Oldham Evening Chronicle was published by Hirst, Kidd and Rennie Ltd but administrators KPMG said the company was hit by the "changing nature of the local media landscape". The majority of its 49 staff have been made redundant. One of the title's veteran journalists said the news came as a "huge shock". John Gilder, who had worked with the paper since 1981, said: "It will be sadly missed. It generates a lot of chat among local people. "Before I found out, I popped into the shop and bought a copy without knowing it was the last one. I like reading a physical newspaper but very sadly it's no more." The Chronicle was established in 1854, and its publishers also produced four monthly titles and three quarterly magazines. They were the Oldham Extra, Saddleworth Extra, Tameside Extra and the Dale Times, as well as magazines Oldham Business Edge, The Knowledge and Primary Knowledge. KPMG said they were looking for a buyer for the title to "ensure its heritage will be preserved" but none had been found. The company also ran a promotions arm called Reader Holidays in conjunction with the travel sector. KPMG said anyone who had paid deposits for holidays would be contacted by the administrators and refunded "in due course". Paul Flint, a partner at the firm, said: "The company was faced with an increasing deficit in its defined benefits pension scheme in addition to the challenging trading conditions arising from the changing nature of the local media landscape. "Unfortunately despite a rigorous sales process, a buyer for this longstanding paper has not been found and it's not commercially viable to continue operating."